New Para standard smooth grips offer the same incredible form, fit and function as all of our grips. Made to exacting fit and finish specifications, it's simple, clean and uninterrupted lines might be the one for you. Add a little skateboard tape to your important places of contact and you have the strongest, most durable double stack grip with the best purchase on the market today! New Para standard checkered grips offer the same stability as all of our standard checkered grips, only a small step better! 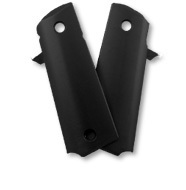 These grips are as thin as they can be without loosing any structural integrity. The checkering depth is between our standard and aggressive checkering. Para grips designed for laser engraving your custom image or logo offer the same stability as all of our standard checkered grips. Click on "View All Para Oval Grip Styles" below, to see all grips with a smooth oval for engraving. 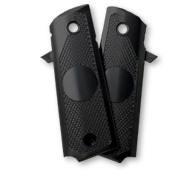 Para grips designed for laser engraving your custom image or logo offer the same stability as all of our standard checkered grips. 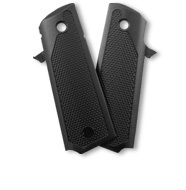 Click on "View All Para 1" Grip Styles" below, to see all grips with a smooth 1" circle for engraving.